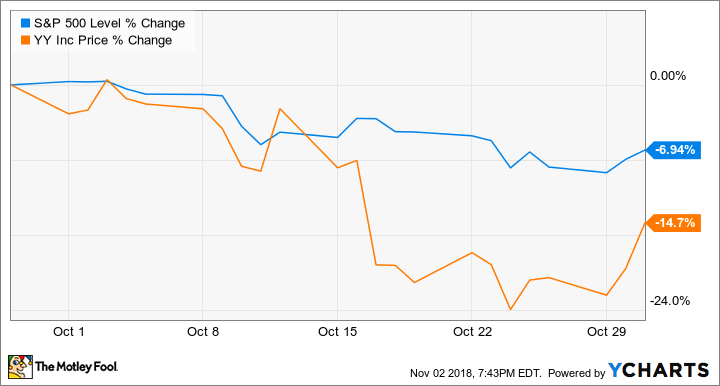 Shares of YY Inc. (NASDAQ:YY) shed 14.7% of their value in October, according to data provided by S&P Global Market Intelligence. The stock fell in conjunction with a broader sell-off and an especially rough performance for Chinese tech stocks. YY has seen steep sell-offs in 2018 after gaining roughly 187% last year. The stock trades down roughly 40% year to date and has struggled due to signs of slowing sales-and-earnings expansion and weakened confidence in China's growth-dependent tech stocks amid broader economic uncertainty. YY shareholders can take some comfort in knowing that last month's sell-offs did not stem from negative news or signs of weakness in the business. 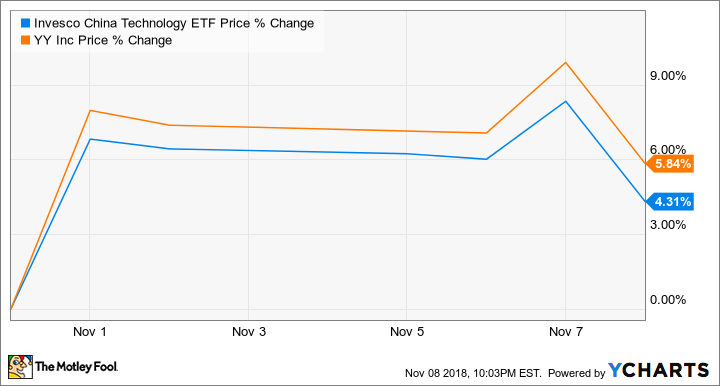 The Invesco China Technology ETF, which combines 74 different Chinese tech stocks into a single security and reflects the performance of the broader sector, fell 15.1% in October. YY's declines closely mirrored those of China's tech sector, which sold off in the middle of the month due to concerns that ongoing trade disputes with the U.S. will cause the Middle Kingdom's economy to cool. The Invesco China Technology ETF is now down roughly 30% year to date. As a video-based social media company that generates almost all of its sales in the Chinese market, YY's business does not appear to be at great risk from trade disputes. The company's performance would likely be impacted by slowing growth and tightening economic conditions that could result from a prolonged trade war, but its core business of hosting video streamers and collecting a portion of donations sent to them by viewers should be largely unaffected by tariffs. For long-term investors, the possibility that China's government will implement stricter rules and restrictions for streaming platforms is probably the bigger risk. YY stock has recovered some of the ground it lost in October, with shares trading up roughly 5.8% in the month so far. Gains have come amid a recovery for Chinese tech stocks and the broader market, with comments from President Trump on Nov. 1 indicating that the U.S. and China could soon reach a trade agreement seemingly providing the biggest positive catalyst. YY is scheduled to report its third-quarter earnings and host a conference call after market close on Nov. 12. The company is guiding for sales between RMB3.89 billion and RMB4.02 billion, representing year-over-year growth of roughly 28% at the midpoint. Shares trade at roughly 9.5 times this year's expected earnings and 1.8 times expected sales.